LOL.. what a wish.. The last thing I wrote on my last blog, I was waiting for my paint pots package from New York. I expected it’d take another week.. Apparently it came several hours after my blog was published. What are the odds!! And I bought a new nail polish. I think I’m getting a bit bored with make up (I’ll talk about that later).. maybe not.. ’cause I went to save on foods to get NYX terracotta blush. Since they didn’t have it, I ended up with something else.. (oh yeah, of course *rolleyes*). 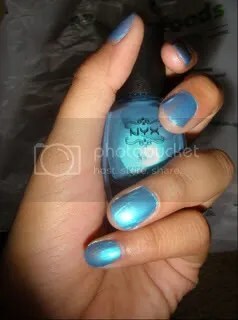 I present you, South Sea NYX nail polish.